Lings Coiffure is a cosmic expansion and plug-in upgrade for Yoshikinakota's venerable HairPack. 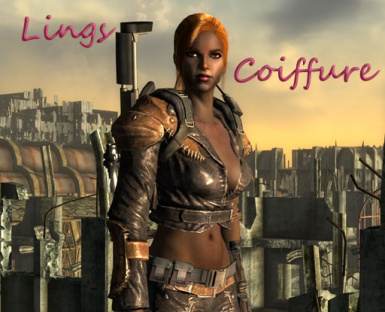 Whether you want to overhaul the wasteland or just have more options for your character at the gene projector, Ling's Coiffure has what you need. 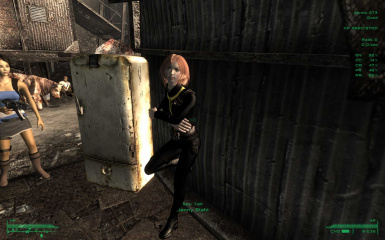 LING'S DOES NOT ADD CONTENT TO FO3. It adds opportunity for users to modify their characters and for modders to enhance NPCs. Modders are free to use this file in any way they see fit short of re-uploading this content in whole or in part. Raiders and Ghouls now playable with correct age-chains and available presets. Tribals and Mutts now playable as well if you have the DLCs. 150 new Character Presets, including all of Ashara and Kendo2's outstanding Presets. All Presets given eyelashes with extended options for female characters. Full selection of hair and eyes for all races. The most comprehensive collection of hair styles available on Nexus, more than three times as many as hairpack. Fully customizable eyelashes for Most NPCs (middle ages). 22 female and 9 male eyelash options. Unique Female lashes for each of the Raider races. Balanced collection of eyes using best of breed textures to enhance variety. More than 5 times the options of Yoshikinakota's Eyesaddon. 99% of the resources conveniently packaged in BSAs. Loose files are only used where necessary (eyes & headparts). Backwardly compatible with hairpack. Any mod using the hairpack master can switch to Ling without messing up existing NPC cosmetics. The very young and very old are given lashes by default. All raiders races have default lashes, with a unique style for the women of each race. For the two adult ages, you can select lashes as head parts customized for NPCs, with 21 varieties for women, 9 for men. Drag and drop simplicity. Yoshikinakota's eyes have been resorted to eliminate redundancy and open up all eyes to both men and women. 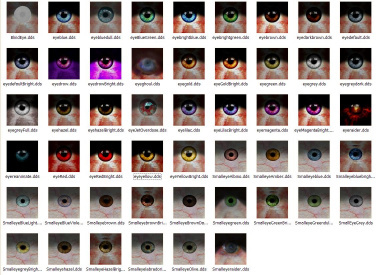 Additional eye colors were added selected for realism and game enhancement. 2 novelty eye colors added for specific usage. An alternate selection of high quality Smalleyes is also included for those who prefer a less anime look. This is a set built with of components of Sparkling Eyes, detailed eyes, and realdetailedeyes - carefully combined for a selection of 18 colors (plus original vanilla raider eyes). These take advantage of normal mapping by copasetic for more depth and are equivalent in size to the vanilla male eyes. This is a boatload of eye options! Ling's eye selection is chosen to stay within the realm of plausible. If your tastes go towards the more extreme, I highly recommend you take a look at Orfevs' excellent FACE cosmetic pack. Female-only hairs opened up for males where they don't clip or just look beyond ridiculous. All hairs added to all races (except OldAged and Children). Adds two new children's hair from Final Fantasy. How do I install Lings Coiffure? Please use FOMM package manager to install. If you install manually, it is expected you know what you are doing. The two files and two directory in green must be installed to your fallout3\data directory (same as every other mod you've ever installed). Please familiarize yourself with file manager and 7zip if you are not already. What is the Load Order for Lings Coiffure? 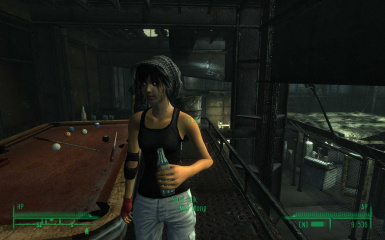 Lings.ESM should be installed high on your load list, preferably immediately after fallout3.esm or DLC content. What about the compatibility patches? LingsDLC.esm Provides compatibility and playability for the races added by official DLCs. Requires ThePitt and Point Lookout. What about HairPack or other cosmetic mods? What if I'm getting messed up hairs? This mod is NOT compatible with any existing cosmetic mod, including hairpack, hairday, or project beauty ESMs. These must be disable for the cosmetics to work. 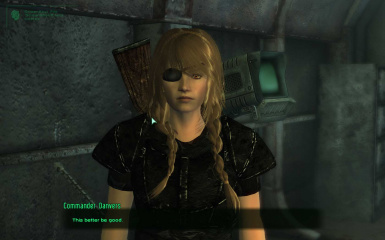 Remember, if you load a mod requiring hairpack, FO3 will load the master even if disabled via FOMM. What if I use mods that require HairPack? Lings is EditorID compatible with hairpack and many hairpack extensions. It works flawlessly as a drop in replacement. Edit the master files hairpack.esm and replace it with Lings.esm as shown in the image link below. You can use the same technique to add Ling.esm as a master to any project beauty esp. Does this mod conflict with Project Beauty? 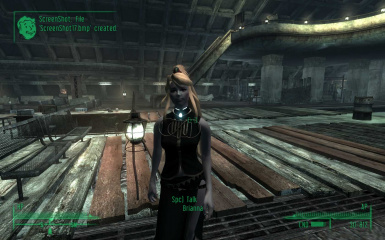 Project Beauty ESM is incompatible with any mod that alters race, hair, eyes, lashes or NPCs. With regrets, therefore, I can offer neither a compatibility patch nor support for integration with PB. That said, here's some tips should you try to do it yourself. 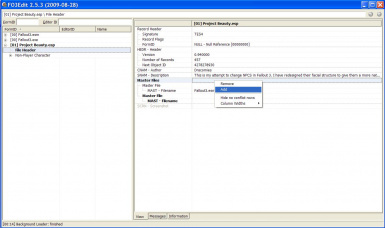 ProjectBeauty.esp can be made compatible with Lings using FO3edit and the techniques above. 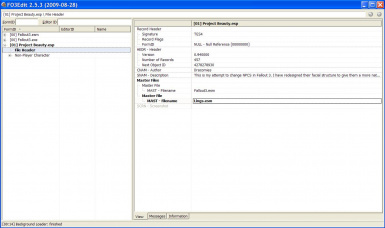 Any Project Beauty ESM contains conflicting cosmetic data and cannot easily be made compatible. With the exception of eyes, all of the skin textures etc. bundled into "HD' should not cause conflict. Lings has almost all the needed resources in the bsa. Only the eye textures and head meshes are included as loose files. You can delete the contents of the following directories if you have them. NOTE: Don't remove any subdirectores if you have them! Proper Credits can be found in the credit file. Thanks to the many fine artists that made this mod possible and FO3 such a great game. Special thanks for TonyTheWookie who did the heavy lifting and allowed me to stand on the shoulders of giants. Good Hair Day formed the basis of this mod. This release of Ling's Coiffure is final. No further developments or fixes will be released. This mod is free from any significant bugs in either content or installation. If you are having difficulty with resources, start by cleaning out your folders as detailed in the section above and re-installing. The mods Lings Finer Things and Lings Pretty Things are no longer available on the Nexus, but they live on somewhere in cyberspace. Google it.